Discover how phone systems can automate your business by automatically routing calls 24 hours a day seven days a week, reduce time spent with unwanted and annoying phone calls, eliminate the need for a costly fax line, make you and your associates more available to your customers. The Samsung Phone Systems is a perfect match for business small to what we would call mid size business with many advances features available at your finger tips. Same day and next day installations available in Los Angeles County. The full featured Panasonic Telephone System designed for small to extra large business and hotel motel with the needs as small as three phones to extra large business with the need of one thousand phones or more. The Nortel line of business phone systems are a good match match for most any business application with voice mail and call cueing. Small systems to large systems with more than 30 phones the Nortel will work well. The Panasonic and the Samsung Telephone System provide many useful features like: Auto Attendant Call Forwarding on and off-site, Call Hold, Caller ID, Call Logging, Cordless Phones, Door Phones, Intercom, Music or Message on Hold, Paging or Public Address, Voice Mail Voice Mail to Email, and a lot more. Please make sure to let your sales rep know what features you are interested in because licensing and hardware may be required. Phone System from E System Sales, Inc.
You can expect courteous and professional sales personal trained to extract the right information to provide you the right phone system application to what your needs are, professional installation services, self installation support, remote programming services to make sure your new system is performing to meet your expectations, all questions answered when needed for as long as you own your new Telephone System. Both the Panasonic and Samsung Phone Systems fully support most all of the different VoIP applications like Trunking for instance, you can connect Vonage of Magic Jack type of incoming lines directly to the System or you can configure what is known as SIP trunks that are configured or programmed with a user name and password into the system. Doth systems also support what is know as IP phone connected to the system either using your local Ethernet network or over the internet at other locations like a home office or a second location. The Panasonic and Samsung also support the connection of multiple systems together providing users the ability to call or transfer callers to other extensions at other locations over the internet. Note VoIP Extensions connected to a system are cost effective if a phone needs to be connected to the system off-site at a home office or a second business location. You can expect either professional installation services or support for self installers that want to install the phone system them selves. Once your new phone system is installed we provide free programming services for systems with the purchase price of $3000 or more with 60 days of updates to doubly make sure your new Telephone System is programmed and working the way you want it to work. We program the systems safely and securely using Show My PC where we log on to your Windows PC and log out when we are done. A Windows PC and a Cable or DSL internet connection is required. A satellite internet connection will not work. Basically a phone system is a phone system. They all perform the same basic functions and features. 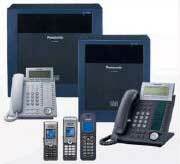 We have found the quality of a name brand phone system such as Panasonic, and Samsung are high quality systems. They do not fail. The bottom line is: it is all about the price of the phone system and who you feel comfortable doing business with. NEC and Panasonic phone system installation, training and support services available in all of New York, Maryland, Philadelphia, PA and New Jersey. All you have to do is say yes and we will have your new phone system installed with in 5 to 7 Business days. Needed in New York, New Jersey, Maryland, & Philadelphia, PA.
Panasonic, NEC, Avaya, and Samsung. Now that you’re here, you have access to the five top phone systems manufacturers Bizfon 680, Comdial DX80, NEC DS1000/2000, Norstar Nortel, Panasonic KX-TA & KX-TD, Avaya, and the Vodavi Starplus STS. You can choose the one that provides exactly the features you need for your business at the most competitive prices. Nationwide local installation affiliates available in your area for immediate installation. All you have to do is say yes and we will have your new phone system installed within 10 days. No more costly service calls for system programming. Do it yourself installation. E System Sales Support. With knowledge of telephone wiring and adequate computer skills, you can save money on your initial purchase as well as system system maintenance costs. We provide unlimited programming and installation support on NEC, Panasonic, and Bizfon Phone Systems with a minimum purchase of $749 through EZ System Sales web based support help desk. Our web based support help desk is available to our customers 24 hours a day and is filled with FAQ's, installation and programming how to's. We have taken the manuals and rewritten the most popular programmed features with pictures and in terms the end user can understand. If what you want to program is not posted on our support website email us and we will post the how to for you. EZ Call transfer of calls to associates and unavailable associates voice mail. With the touch of 2 buttons your phone attendant can have a call into an unavailable associates voicemail in seconds. Save time and money in this instance a phone system can pay for its self in 6 to 9 months. Phone System Starter Kits. Kits and hardware additions available at reduced costs for each system E System Sale Phone System. Isn't it time you take control of your phone system? Find out how easy phone system programming can be and never have to rely on costly technician service calls ever again with our web based support desk available 24/7, Holidays and Weekends. Multitech Voice Over IP. Toll free long distance calls world wide VOIP units that plug into any CO/Trunk port using both SIP and H.323 Voice Over IP Protocols make most any phone system an IP phone. Extend and extension offsite and have all of the capabilities as if on-site.